The BM-13N is a gift Rank II Soviet tank destroyer with a battle rating of 3.7 (AB/RB/SB). It was introduced during Update 1.67 "Assault" as part of a Victory Day Event known as "KATYUSHA" during the span of May 06 - 10. The vehicle is unlocked during the event by destroying five vehicles using the BM-8-24. One of the most unusual vehicle in game, to say the least. 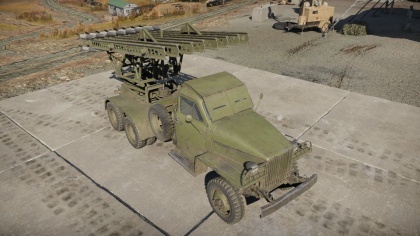 Not only is its truck-based configuration not the most common, it also uses 16 x 132 mm M13 rockets as a main armament, has limited traverse, only 2 crew member, and a gun depression of +8°. The last is somewhat compensated by its ability to lean forwards with a hydropneumatic suspension system found on some Rank 5 vehicles. Its gameplay is somewhat comparable to other unique premium machines such as the T34 Calliope or Panzerwerfer 42, but remains a rather unique experience. The BM-13N, also known as Katyusha, is an artillery piece, belonging more in an artillery formation than in a tank battle. One should stay at a distance from the enemy since its rockets have a blind zone of about 250 meters in front of the truck when moving on a flat surface. This is best used as it was back in the days: to support allies. Best used in RB, it is a nasty surprise. No armour in front grille, simple 7.62 mm machine gun rounds can enter and damage the engine. 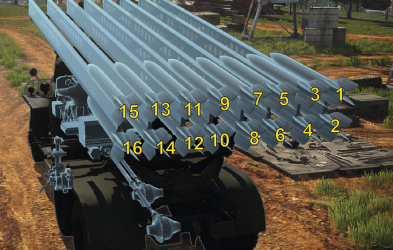 Ammo racks of the BM-13N. This truck is a real killer in an open field, provided it could hit its target before it is noticed. Since its main sight lack ranging marks, one should estimate the correct angle, shoot a rocket, watch where it lands, adjust fire, retry it as many time as it needs. Do not take too much time at range finding since a single shot can end your day. Once the correct angle is found, 'unleash hell on your enemies, blinding them with dust lifting up from the ground, detonating ammo racks and blasting off tracks. This is basically an intelligent artillery barrage. Once all rockets are fired, fall back behind ally lines, find a captured objective to reload at, repeat. Best used in an urban combat scenario, when your team is losing. In these kind of times, enemies often rush the base/objectives without watching corners very well. This is your chance: find yourself a pile of rubble and lift the rear of the truck on it in such a way that you can fire right in front of you, past the corner. When an enemy passes by, spread it with rockets until it dies, using your good rate of fire. This tactic is often a last resort since you're cornered and encircled, you may kill 1 or more enemy if you're lucky but you will eventually be spotted or run out of rockets. Tank's bellies: since almost no tank has more than 40 mm of armour underneat, it can disable them. Tracks: To immobilize your foes, providing your allies a chance to finish them off. Some tanks store ammo over the tracks, it can detonate them. Gun barrel: Blasting off your ennemy's gun barrell will incapacitate it from effectively firing back at your allies. Engine deck: Can disable a tank's engine, in the best case scenario igniting it. Turret front/ Commander's hatch: Many tanks have weak top armour, use it to your advantage. Can be used in deceptions: A similar model is used as decorations on some maps, without rockets and add-on armour, which may allow the player to hide. Works better when in group of 2 or more. 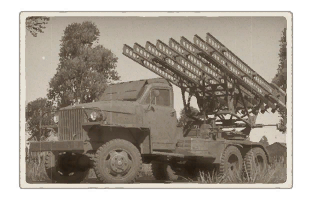 The Katyusha rocket launchers first saw service during the opening of Operation Barbarossa against Germany. On July 14, 1941, under the experimental battery commanded by Captain Ivan Flyorov, seven launchers were used in Rudnya and were able to cause massive destruction to the Germans in the town before they fled in panic. This success prompted the Red Army to build up more Katyushas in their inventory and raise more batteries and regiments for the vehicle. All these units were under NKVD control for secrecy until the Germans reveal their own multiple rocket launcher system, the Nebelwerfer. The Germans nicknamed the Katyusha launchers "Stalin's Orgel", literally "Stalin's Organ" after Joseph Stalin and how the launchers are organized in a way which looks like a church organ. This German nickname became widely known in other areas in Western Europe. By the end of 1941, eight regiments and 37 independent battalions were available with a count of 554 Katyushas total. The rocket launchers continue to become more integrated into the rest of the army as the war continued. Heavy mortar battalions were armed with the newer M-30 rocket launchers with heavy 300 mm M-30 rockets in June 1942. In July, a battalion of rocket launchers was added to the tank corps. The organization and equipment of these mortar battalions equipped with the Katyusha continue to increase and by the end of the war in 57 regiments, about 518 batteries of Katyusha launchers were available. Skins and camouflages for the BM-13N series from live.warthunder.com. [Event] BM-13N: Say Hello from Katyusha! This page was last edited on 5 April 2019, at 00:53.